The extra change between your couch cushions, in your vehicle’s cup holder, desk drawer and that quarter behind your ear can make a big impact for dogs and cats! GIVE SMALL CHANGE TO MAKE A BIG ONE will run October 1 through October 31, 2015. You can help by hosting jars at your office or place of business. Proceeds will benefit 4 Luv of Dog Rescue and CATS Cradle Shelter. Coins deposited will add to the jar’s total. Paper bills deposited will subtract from the jar’s total. It’s cats vs. dogs, who will win? Everyone! All proceeds will be split evenly between CATS Cradle Shelter and 4 Luv of Dog Rescue. The winning Shelter/Rescue will be announced via Facebook shortly after totals are tallied. 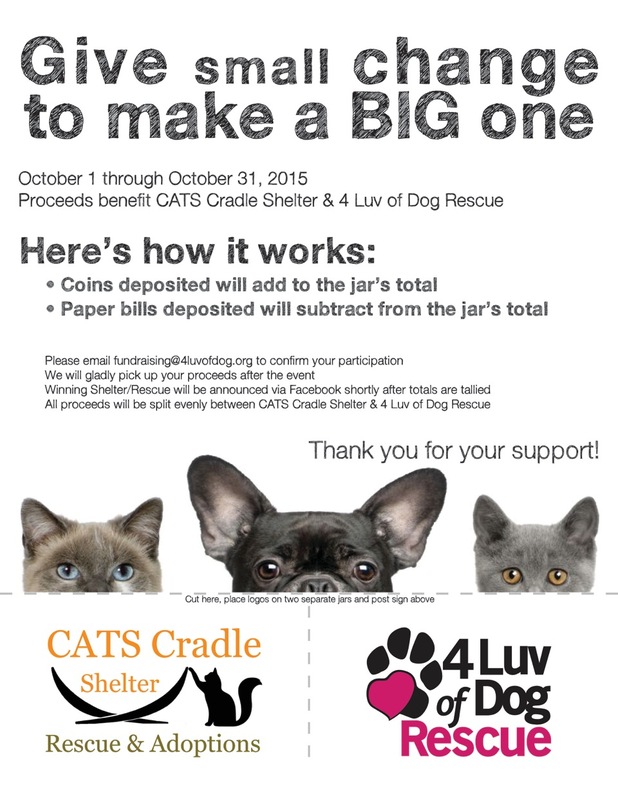 Email fundraising@4luvofdog.org to have a poster, CATS Cradle Shelter jar and 4 Luv of Dog Rescue jar delivered. Or, use jars/containers you already have and email fundraising@4luvofdog.org to have a PDF poster emailed to you to print. Thank you for giving small change to make a BIG one!